STARTER KITS Set yourself up for success with a Young Living Starter Kit! Including business-building materials, product samples and useful accessories, these kits are the perfect way to introduce someone to the Young Living opportunity and lifestyle. ESSENTIAL REWARDS BUNDLES Get your order automatically every month by enrolling in Essential Rewards! Order individual products of your choice or benefit through discounts* on these Essential Rewards Bundles. You can earn points towards free products, receive discounted shipping, customise your order each month and get exclusive rewards. With so many perks and bonuses, there’s no better time to start than now! Visit YoungLiving.com.au > Member Benefits > Essential Rewards for more details. *Essential Rewards Bundles are discounted compared to purchasing products individually. Look after the health of your kids with products designed especially for them. Build four pillars of good health with these core nutritional products. EVERYDAY NUTRITION ER BUNDLE Nourish your body's nutritional needs with NingXia Red® and OmegaGize3 ®! INNER HEALTH ER BUNDLE Achieve the ultimate in inner health with products that protect & support digestion. ANIMAL CARE ER BUNDLE All the products that your beloved pets will adore in a handy bundle! HEALTHY BODY ER BUNDLE Enjoy natural solutions with safe and pure ingredients you know you can trust. MY 'GO TO' ER BUNDLE This portable bundle means you'll always have these essential products on hand. BEAUTY ER BUNDLE Treat your skin with our perfectly designed pamper pack! HEALTHY & FIT ER BUNDLE Stay healthy and fit with these carefully chosen essential oil-infused products. Energise, fortify and revitalise your body and mind with NingXia Red®, a delicious superfruit blend. Experience healthy cooking for the body, mind and soul with culinary essential oils. HEALTHY HOMES ER BUNDLE Protect your family and purify your home with effective products free from toxins. Nurture yourself or a loved one for emotional wellbeing in any situation. Discover a natural and holistic way to energise and balance your health. With more than 20 years of research and experience, we’ve perfected our Seed to Seal® process to ensure that our essential oils are the finest available. This dedication to excellence is what makes our essential oils stand out from the rest and what makes a noticeable difference that you can experience with every bottle. When essential oils work in harmony, the combined effect can be transformative. Our blends are the result of years of rigorous testing and practical application, producing synergistic blends of complementary essential oils that can be used in every aspect of your life. Journey On™ LIMITED TIME ONLY! essential oils Many of our essential oils are perfect for culinary use. Our newly expanded line of culinary essential oils can be added to your favourite recipes for a delicious kick of concentrated flavour. Be sure to look for old favourites as well as new essential oils in this category. essential oil roll-ons Natural essential oils can be yours anytime, anywhere. With our scientifically blended formulas in convenient, roll-on packaging, you can bring the pure essence of Young Living with you wherever you go. essential oil COLLECTIONS Let our expertly assembled collections guide you toward harmony and wellness. This selection of essential oils and blends makes it easy to choose the best Young Living products for your unique needs. PR O D UC T DE SC RI P TI ON Aroma Complete™ Large carry case containing most essential oil singles, blends and essential oil bottle labels. Contents are subject to change and may vary without notice. Contains 9 x 5 ml essential oils (AromaSiez™, Basil, Cypress, Marjoram, Oregano, Peppermint, Thyme, Valor II™, Wintergreen) 1 x V-6™ Enhanced Vegetable Oil Complex, 1 x Ortho Ease® Massage Oil. 1 x 30-oil carrying case,1 x Essential Oil Bottle Labels set, 15 x 5 ml essential oil singles (Cedarwood, Cinnamon Bark, Clove, Copaiba, Eucalyptus Blue, Frankincense, Grapefruit, Lavender, Lemon, Lemongrass, Tea Tree, Northern Lights Black Spruce, Orange, Oregano, Peppermint), 15 x 5 ml essential oil blends (Abundance™, AromaEase™, Citrus Fresh™, DiGize™, EndoFlex™, En-R-Gee™, Envision™, ImmuPower™, Melrose™, PanAway®, Purification®, R.C.™, Sacred Mountain™, Stress Away™, Thieves®) Contents are subject to change and may vary without notice. Massage oils Take the power of massage to a whole new level with our line of massage oils. The unique essential oil blends in our massage oils have the power to bring your massage experience to new heights. essential oil DIFFUSERS Transform your home, office or personal space into your personal aromatherapy oasis! Our elegantly designed diffusers will allow you to infuse essential oils into every part of your space and create a spa-like experience anywhere life takes you. *Free Lemon 5 ml and Lavender 5 ml essential oils with diffuser purchase. Not valid with Premium Starter Kit purchase. ^ Free Thieves® 15 ml essential oil with diffuser purchase. essential oil accessories Bring your essential oils experience into full balance. Including everything from durable carrying cases to colour-coded bottle labels, our accessories make it easy to keep your precious essential oils organised. Soft case, holds 130 oils. For 'Carry Case - Large' only. LANTERN DIFFUSER The stunning Lantern Diffuser, exquisitely crafted and detailed from metal and glass, transforms any room by permeating the air with the aroma of your favourite essential oils. With run times of up to 10 hours and 11 light features, the Lantern Diffuser is the perfect complement to any gathering. Young Living’s unique Thieves® blend is crafted in the tradition of four 15th-century French thieves who created a special aromatic combination of clove, rosemary and other botanicals. Our Thieves® product line brings safe alternatives to your home, so you can replace harsh chemicals with naturally derived formulas that work hard and smell amazing. Thieves® Fruit & Veggie Soak NEW! CREATE A HEALTHY HOME with Young Living's Thieves® range! Thieves® cleaning products are made exclusively with all naturally derived ingredients, so you can feel good knowing that you will get an effective clean without introducing harsh chemicals into your home. SEEDLINGS Our Young Living Seedlings™ line offers expertly created, essential oil-infused baby products that are safely diluted for babies’ sensitive skin. Free from harmful ingredients, this line’s gentle, plant-based formulas were specially created to carefully comfort the smallest members of the family and give parents peace of mind. kidscents Raising kids gives you enough to worry about - let Young Living’s gentle, all-natural children’s products make your job a little easier. From toothpaste to bath products, our KidScents® range is made with safe, mild essential oil formulas. animal scents You love your furry family members - and so do we! Give your four-legged friends products infused with essential oils designed especially for them. For more than 700 years, the northwest region of China known as Ningxia has earned a reputation for producing and cultivating premium wolfberries. Also known as goji berries, wolfberries have a rich nutritional profile. NingXia Red® is our powerful superfruit supplement designed to energise, fortify and revitalise the body and mind. This delicious, proprietary blend features pure essential oils, NingXia wolfberry puree and other superfruits to supply the body with vital phytonutrients. slique With a unique combination of exotic ingredients and powerful essential oils, our Slique™ range can help you can take a step in the right direction - toward a healthier, happier you! When combined with a proper diet and exercise, Slique™ products can help create feelings of satiety and provide nutritional support. YOUNG LIVING'S SLIQUE ™ RANGE Slip into a new you! Our Slique™ line is formulated with unique natural ingredients, designed to support your healthy lifestyle! EINKORN FLAKES CEREAL Gear up for any kind of day with the sweet crunch of Gary’s True Grit™ Einkorn Flakes Cereal. Made with whole ancient grain einkorn, oat bran and lightly sweetened with coconut sugar, these flakes are a nourishing morning meal the whole family will be excited to wake up for! essential nutrition Vitamins and minerals are two of the foundations of a healthy diet. However, diet alone often cannot provide sufficient amounts of these important nutrients. Our convenient multivitamin supplement solutions feature bioavailable food-sourced vitamins and minerals that contain an infusion of powerful essential oils to give you the support you need. Gary’s True Grit NingXia Berry Syrup LIMITED TIME ONLY! Feel confident without compromise with Savvy Minerals by Young Living®. This mineral-based makeup line combines premium formulas with pure ingredients, so you can embrace your natural beauty without sacrificing your standards. With a variety of shades and colours, you can find the perfect products to help you make your mark. *Includes the Savvy Minerals by Young Living® products launched prior to 14 July, 2018. Please refer to Virtual Office or website for full contents list. Contents, pricing and PV of the Savvy Minerals by Young Living® Business Bundle is subject to change. Young Living’s skin care products bring together premium botanical and essential oil ingredients to support and improve the appearance of your skin. This line offers essential skin care solutions for every skin type, with products that are expertly formulated to help keep your skin looking healthy and smooth. body care It’s important to be conscious of what you put in your body. Your skin is your largest organ, so it’s equally important to be careful what you put on it. Whether you’re looking for a shower gel, moisturiser, soap or deodorant, this toxin-free line has you covered! 3 pk, 236 ml ea. REFRESHED & INVIGORATED Enhance your shower experience with the crisp, effervescent scents of Eucalyptus and Peppermint or the clean, bright aromas of five citrus oils and Spearmint with our all natural, vegan-friendly shower steamers. MEN'S CARE Freshen up with shaving and grooming products specifically formulated for men, all featuring naturally derived ingredients and premium essential oils. Our men’s line includes everything busy men need to care for their skin and body, leaving a head-to-toe clean and natural confidence. hair care Give your hair the care it deserves! Our hair care products are made with plant-based, safe and environmentally responsible ingredients, so you don’t have to worry about introducing any unwanted toxins to your hair or putting them back into the environment. Infused with our potent essential oils, our hair care line will help invigorate your morning routine. delivery time All orders are dispatched within 48 hours of receipt of order. Please allow 2 - 3 business days for deliveries to metro areas and up to 10 business days for deliveries to the Northern Territory and remote areas. e s s e n t i a l r e wa r d s Rewards apply to regular monthly orders on our Essential Rewards Subscription program. p r i va c y Your upline can assist you with ordering, product knowledge and business support, and may contact you to provide this. Young Living respects the privacy of its members and your contact information is not disclosed outside of this, unless with your permission or if required by law. returns Young Living reserves the right to review each return on a case-by-case basis. Returns within 90 days may be eligible for exchange with items of at least the same PV if not genuinely satisfied. Non-PV items may not be returned unless faulty. A 25% restock administration fee applies to Essential Rewards Subscription orders. A return authorisation number must be obtained by phoning Member Services on 1300 28 9536 before returning items, if your return is to be accepted. Please refer to current Policies & Procedures for full details. 10 day cooling off period Young Living Essential Oils (Australasia) Pty Ltd stands behind its products and Business Plan. If you are not satisfied with your purchase, for any reason, return the product to your point of sale within ten (10) days of purchase to exchange for an equivalent price product, or for a full refund of your purchase price. This Satisfaction Guarantee is in addition to the Young Living thirty (30) days warranty allowing customers to return unused product for a full refund of purchase price less shipping charges. notes Young Living makes every effort to maintain product pricing throughout the calendar year. Due to the nature of our product offering however, all prices are subject to change. Orders need to be picked up within 5 business days. VISIT YOUNGLIVINGGEAR.COM.AU for a range of banners, business cards, clothing & more! A powerful way to connect! Young Living Gear is your one-stop-shop for all business requirements, from business cards to banners. Simply order through this easy-to-use website and the hard work is done for you! To join Young Living and receive the fantastic savings and opportunities of Essential Rewards, visit YoungLiving.com.au to get started. If you are already a member, login to your Virtual Office and sign up to start earning these incredible rewards! We take the stewardship of our planet seriously. 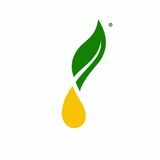 Our state-of-the-art production process brings you the purest oils on Earth. This document was printed using paper from responsible resources. 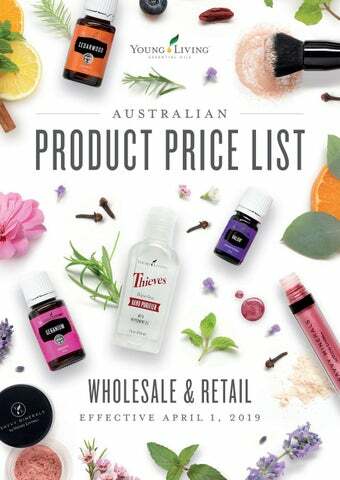 A comprehensive guide to all pricing for Young Living products available in Australia, effective April 1, 2019.